Incident Details: A 70 year old gentleman, walking on his own, slipped whilst descending Castle Crag, and took a 10 m tumbling fall into an old quarry working. He suffered a head injury in the process. Fortunately a group of walkers heard his shouts, and looked after him till the Team appeared. 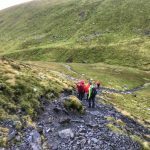 The Team set off to Grange with two vehicles full of personnel, and made their way swiftly up the Allerdale Ramble to access the casualty site. Almost simultaneously, North West Ambulance Service mobilised their helimed from Blackpool to come and assist. The Team splinted the casualty into a vacmat to protect his neck & spine, and he was then stretchered down to a field nearby to be loaded into Helimed 63. Because of the nature of his injuries, he was flown to the Royal Preston Hospital. The Team then returned to base after five rescues in five days. 16 Team members – 2 hours 20 minutes.